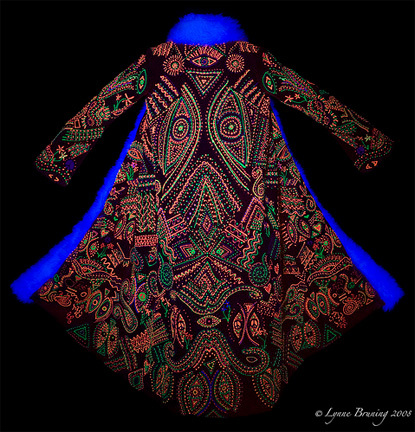 Interview with Lynne Bruning: Doing Groovalicious eTextiles! She holds an Bachelor of Arts in neurophysiology and Masters in architecture. Her artworks have been published in numerous fashion magazines, web zines and all over the blogosphere. She lives and works in Denver, Colorado. LB: Every girl’s dream is for a fast neural connection. You also hold an MA in architecture… how did you jump in these shoes and what fascinates you in architecture? LB: This was a jump in scale, not function. My time in neurophysiology was working with electron microscopes focused on a cellular level research. While architecture was about using cranes and concrete to design the built environment for those conglomerations of cells to inhabit. Realistically, a human body and a building have all the same elements – circulation, respiration, temperature regulation, waste removal, skin, fenestrations, energy production ect. Same functions. Different materials and scale. Simple, yes? Indeed, I love to be surrounded by beautiful well designed architecture. Just to inhabit this type of space can elevate your spirits, dictate how people will behave or place you in majestic awe. I recommend you seek out exceptional architecture every day and soak up the vibes of honesty, integrity, form, function and beauty. It will make you a happier person. 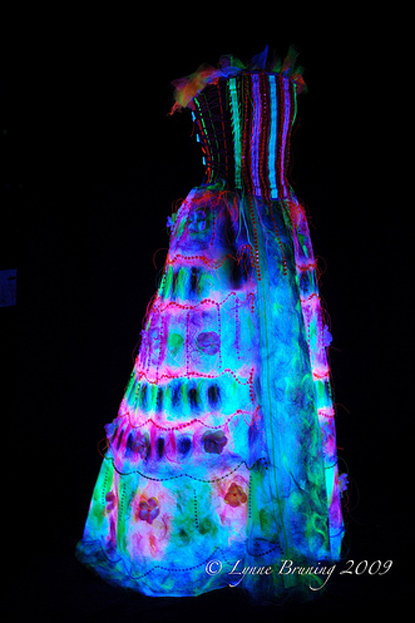 Does it mean that you see your textile design and fashion as a sort of sculpture? LB: I see my creations as a symbiotic combustion of fashion, art, sculpture and science and the wearer adds dimension by breathing life into the textile product. When did your interests in textile art start? 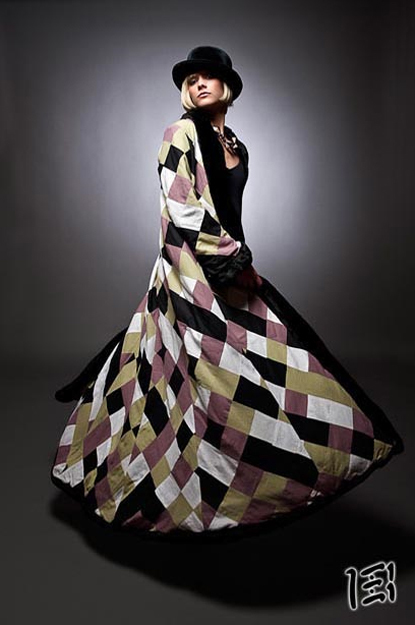 LB: I come from a family of sewers, quilters and knitters so I have always been surrounded unique textiles. I have slept under my great-grandmothers wedding ring quilt and worn prom dresses designed and sewn by my mother. As young children we were taught to seek unique independent shops to find speciality fabrics, buttons and yarns. Yet, I think it all began when my mother brought me home from the hospital swaddled in a pink mohair blanket her father had found in Peruvian Andes. LB: I don’t consider myself a fashion designer. Yes, I make garments that people wear, yet you can just as well hang them within a frame and they function as pieces of art. 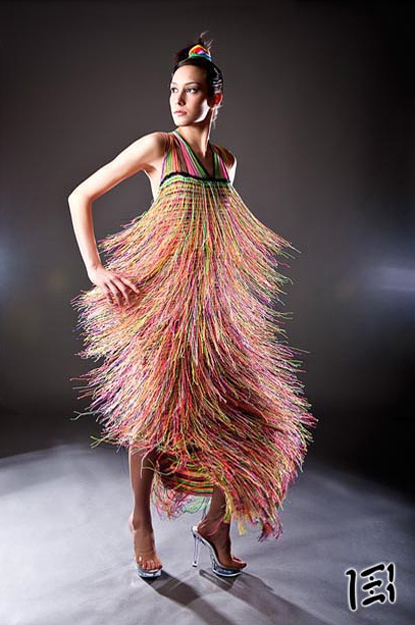 Fashion is simply a byproduct of my artistic and scientific process. My creations are actresses in a performance art piece on the stage of the Theater of Life. Sometime the cloth is animated by motion. Sometimes by light. All are at their best when being worn on life’s main stage. When exactly did you first get into eTextiles industry and how did it come about? LB: In 2006 I ordered stainless steel thread from Texture Trading Company. Once I had it, then I wondered what to do with it. Fortunately, the LilyPad Ardunio was soon released. How would you describe your own work and aesthetics? 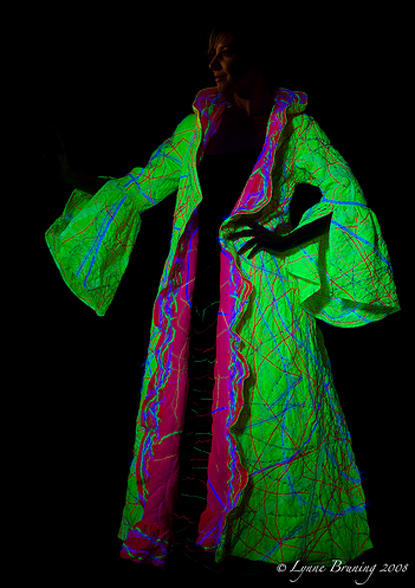 LB: I call it: exploratory innovations in textiles, garment construction and eTextiles. Others simply refer to it as groovalicious. LB: I do love an infusion of intensely vibrant colours. It’s like walking thru a tropical garden while the rising sun warms the skin and awakens your vibrantly illuminated world. 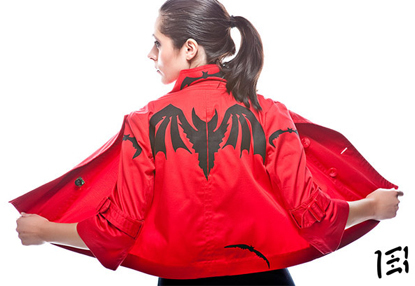 Can you tell us more about your artwork Haptic Coat for the Blind entitled Bats Have Feelings Too! LB: Here is a little story for you that explains why I made Bats Have Feelings Too! as a creative commons project. When I was five, my Grandfather piled my brother, our 15 year old gardener Joseph, copper pipes, butane torches, plumbing supplies, a couple of goats and me into our ancient Ford Fairlane. We drove deep into the Jamaican Blue Mountains to Joseph’s hamlet where there was only one water spigot for a community of hundred people. That day, I watched and learned as Grandfather taught Joseph, and eventually an entire village, how to install copper plumbing. Demonstrating as he ran the line from that spigot to Joseph’s one room concrete block tin roofed home. This event was the beginning of many do-it-yourself lessons and is the grounding source of my ideal for democratization of technology. That day Grandfather changed many lives by sharing the knowledge of how to use technology and a few simple tools to improve your world. With Bats I hope I have shared a building block, a jumping off point, for the global development and use of a ‘wearable cane’. It is a project that can be made anywhere in the world. It can be tailored to that specific persons aesthetics and mobility needs. Most of all it shares Grandfather’s belief that anyone can solve a challenge thru technology, ingenuity and determination. 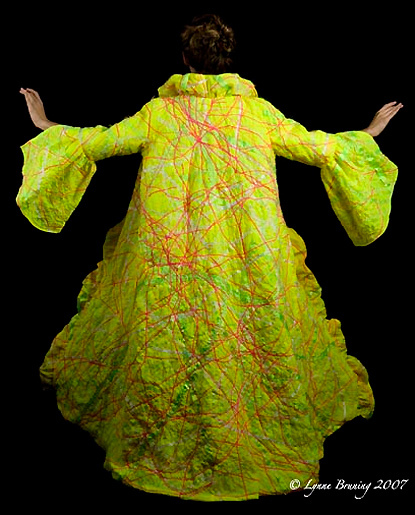 What has inspired you to create Synaptic coat? LB: Synaptic was derived from looking thru too many scientific journals at day glo images of celular structure. While her fluttery edges and triple layer structure remind me of sea slugs lightly skimming across the sand. Could you describe a process of designing your interactive garments… More precisely, is your design process different when you design interactive fashion compared to when you design clothes? 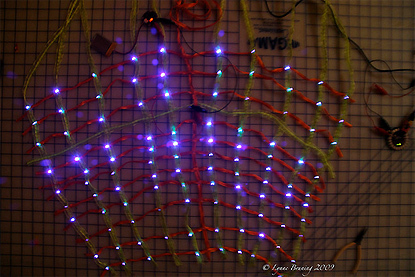 LB: Interactive garments require more advance planing due to circuitry design and integration so I begin with that focus in mind. While my art develops from a fiber – it’s drape, texture, luminosity, transparency etc. Even when I create or weave my fabrics I frequently don’t have the final product in mind. I let the fiber dictate the direction of the final creation. What techniques and equipment do you use in your work? LB: I have 2 looms, 5 sewing machines, knitting needles, irons, and a hot glue gun that I should use more often. My techniques are rooted in a simple childhood lesson – that if I can dream it, I can make it. That is, as long as I work really really really hard and ask for help when needed. Compromises in a fiber or method may be require as I problem solve my design. Yet, these alterations generally lead me to a final product that is even better than I dreamed of. Yet, ultimately, I rely on the gift of dreams, experimentation and perseverance. What fibers and textiles do you use and why? LB: I prefer natural fibers for their ecological responsibility, yet I have been known to weave with atypical elements such as surveyor’s string, grass, plastic bags because you never really know what will evolve from these experiments. I also save and use all of my fabric scraps as with the patchwork series and then those scraps are used for the string series. 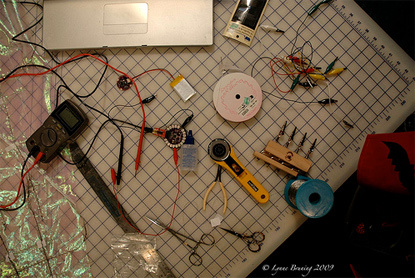 You are a truly active member of the international DIY scene… You have shared your experiences not only through workshops and classes but via web based projects such as Instructables and Makezine… What is your opinion on development of DIY scene in wearable technology context? 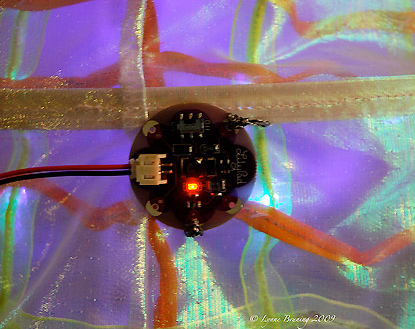 LB: eTextiles are an innovative global exploration where many of the cutting edge developers believe and support the principals of open sources and creative commons. By sharing our experiences over the internet we have been able to quickly advance our collective progress. I hope that sharing information and fostering DIY projects will continue as the field matures. How do you see the future of wearable electronic technology? LB: Vast. Exciting. Profound. Groovalicious. Who are your favourite artists? And why? LB: Leonardo da Vinci for his amazing unending creativity and innovation. David Hockney: understanding and documentation of multiple perspectives in one piece of art. Documentary A Bigger Picture comes out this summer “John Tusa Interviews David Hockney (2004)”. Louise Bourgeois: depiction of the psychosocial within her inhabitable spaces – The Spider, The Mistress and The Tangerine. David Lynch: he’s so rad! 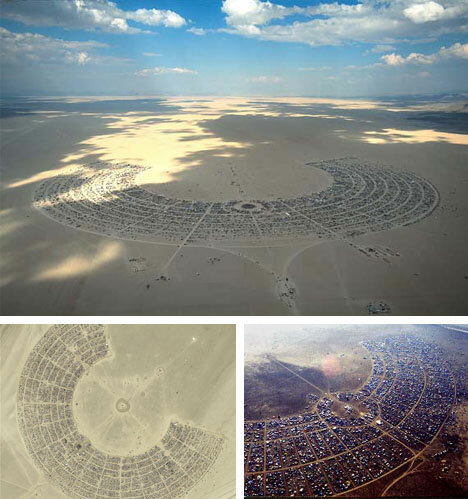 You have worked for Burning Man Festival? What’s the atmosphere and the whole vibe there like? For me the vibe on playa is about finding and understanding your super special talent. We all have something we excel at. Its your most natural talent. Once you understand it, then you give it away to the community. Frequently and freely. When everyone comes together and offers their super special talent to the collective group – anything and everything is possible. Be it large scale art as with Big Rig Jig or Serpent Mother. Or individual playafashion or to actually building the city for 50,000 citizens. Each one of us has something to offer that makes our collective time together all the more precious, real and vibrant. What will you be bringing to the playa this year? What advice do you have for a person who wants to mess around with textiles, wirez and electricity? LB: Just do it! Its a 3V battery, it’s not like you can hurt yourself. Then, go look at Instructables website for more information. LB: I will be at Maker Faire in San Mateo 22-23 May. Please come say hello! Let’s all learn from Lynne!